← Odette Needs Your Final Votes for Dance Advantage’s Top Dance Blog Contest of 2013!!! 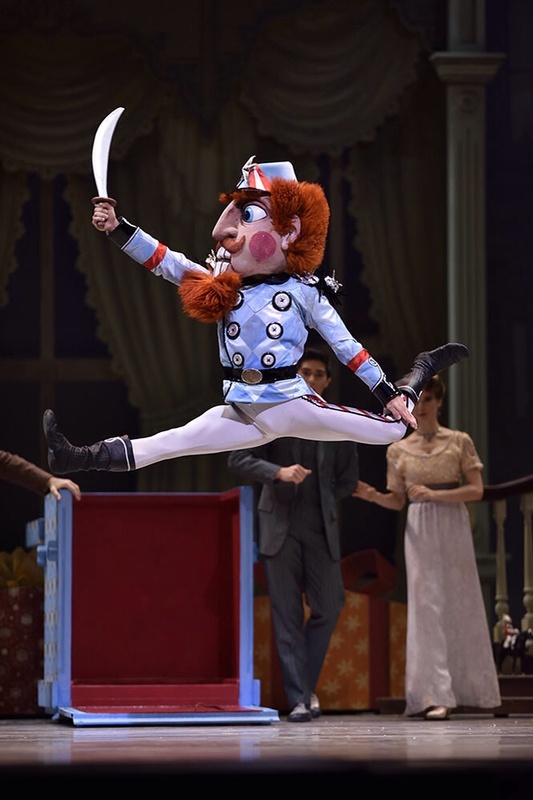 On Friday night, San Francisco Ballet’s 70th year anniversary of its Nutcracker tradition opened to a packed house full of cheers and wild applause throughout the performance. Though San Francisco balletomanes still often refer to Helgi Tomasson’s ‘Nut’ as the “new” SFB version, it is already in its tenth year and looking as fresh as it did in its first. Set in early twentieth century San Francisco, the city which boasts both the first American Nutcracker and the first American ballet company, SFB itself, Tomasson’s version captures the city’s unique charms in a manner that pleases proud Bay Area natives and tourists alike. The prologue’s beautifully crafted slide show of archival photographs, showcasing recognizable landmarks such as the Cliff House, horse drawn vehicles sharing the right of way with early trolley cars on Market Street, and turn of the century clad residents, along with Act 1’s historic Victorian era homes known as ‘The Painted Ladies’ of Alamo Square, and Act 2’s fantasy setting inside a glass pavilion based on the famed Conservatory of Flowers, all conspire to create a uniquely San Francisco experience. Each year I vow not to go nuts with Nutcrackers; SFB’s may be the most well known, but it’s only one of many here in the Bay Area, so it’s easy to overdose on so much Tchaikovsky. Except, I’m always wrong. There is no such thing as too much Tchaikovsky, especially under the baton of Martin West and the award winning SFB Orchestra, as they proved once again on opening night. Conducting to different dancers’ preferred tempos and phrasing isn’t an easy feat, but the maestro did an admirable job. SFB’s Nutcracker is beloved by all who partake in it as part of their annual holiday tradition, but to the company’s serious fans, it serves as the annual prelude to the forthcoming season. After the notoriously long absence from the company’s home stage from early May to December, the War Memorial Opera House once again becomes the realm of tutus, tiaras, tights, and the beautifully toned and meticulously trained artists they adorn. The honor of dancing the role of Clara, the young girl the entire production revolves around, went to Audrey Armacost on opening night. There have been equally lovely Claras throughout SFB history and many of them have found a place in the big company, but none have sparkled more than Ms. Armacost, whose personality and beaming smiles filled the house with joy. A sweeter stage presence would be hard to find. Seeing Ruben Martin and Katita Waldo, both retired SFB royalty, back as Dr. and Mrs. Stahlbaum added to the depth of talent on stage, from the beautifully coached students of San Francisco Ballet School, to the elegantly attired Party Guests of the Corps de Ballet, most of whom doubled (and tripled!) as Snowflakes, Flowers, and in the dances of Act 2. I was nicely surprised to see the return of Clara Blanco as the Dancing Ballerina Doll, a small cameo role she pretty much owned for years, though she has since been promoted to Soloist and now dances more challenging parts, including the Grand Pas de Deux, coveted by every principal ballerina in the company. Clara’s beautiful épaulement was missed last season, while she was sidelined by an injury, and her presence on opening night was more than welcome. Another returning ballerina, most sorely missed last season, was Principal Dancer Vanessa Zahorian, one of the company’s most important and illustrious artists. Vanessa paired with the soaring Taras Domitro as Queen and King of the Snow, in a bravura display of classical partnering, soaring lifts, speed, and delicate pointe work-all amidst the most spectacular snowfall in any Nutcracker production. It’s tough to dance in all that snow, but any mishaps are usually obscured by the stage blizzard. When Taras slipped, he bounced back up like A.A. Milne’s Tigger and quickly made us “fogeddaboudit”, as he returned to the element he seems most comfortable in: the air. In case you didn’t know, this Cuban dynamo catches *major* air. And he is as much a crowd pleaser as Ms. Zahorian, with her incredible turns. A dance review of Tomasson’s Nutcracker would be remiss without mentioning the very major contribution to the beauty of its world acclaimed Kingdom of Snow by Martin Pakledinaz, designer of the most fanciful costumes and headpieces ever conceived for this most stunning of scenes. Per San Francisco Ballet’s glossy program book, the Snow Queen’s tutu takes 80 hours to make and the company has created 5 of them, equalling 400 hours of construction on one character’s tutu alone! And guess what? Its beauty is worth every second, judging by the conversations heard at intermission each year. Act 2’s divertissements give many company dancers opportunities to shine and opening night didn’t disappoint, even after their introduction by one of SFB’s most loveliest ballerinas, Mathilde Froustey, on a two year sabbatical from *the* Paris Opéra Ballet, as opening night’s Sugar Plum Fairy. Lee Alex Meyer-Lorey’s return to the company in 2013 has given many fans reason to rejoice, much as Clara Blanco’s did a few years back, and she sparkled with her fellow Spanish dancers, Gaetano Amico, Sean Bennett, and Steven Morse. But it was Soloist Dores Andre, from Spain, who seduced us with her smoldering flamenco style. A favorite muse of photographers and choreographers alike, it’s difficult to take one’s eyes off her. She has a way of using her eyes to connect with her audience, much like fellow Soloist Sasha De Sola on other nights. Another beloved favorite making her post-injury return to the stage was Soloist Dana Genshaft, whose limber and sultry Arabian dance mesmerized the audience with her supple upper back, slow developpés, and beautifully arched feet. Borne onstage inside a genie’s lamp, by the exquisitely toned arms of lamp bearers Daniel Deivison-Oliveira and Anthony Spaulding, a collective hush came over the audience as the exotic trio performed their sinuous entwinings. Making good use of little stage time, Francisco Mungamba was enormously magnetic and bouyantly entertaining with his high flying and musically timed split jumps to the dragon’s antics in the Chinese dance, also a charming vehicle for the students of the school who animate the dragon. Kristina Lind, an up and coming (and should already be there) Corps de Ballet dancer with, hardly arguably, the most beautiful ballerina feet in the company, and Jennifer Stahl, promoted to Soloist in 2013 after a particularly searing performance as The Chosen One in Yuri Possokhov’s Rite of Spring, would’ve been hard to match by anyone else but WanTing Zhao, an absolutely remarkable tall drink of water that bears following. Closely. This trio got to wear the infamous ‘Cruel Blue Shoes’ of the French Can Can dancers in the Mirlitons section, with no mishaps from the evil, hot pink, twirling ribbons they wield like the most fierce of rhythmic gymnasts. My least favorite of the dances in Act 2 belongs to that of Madame Cirque and her Buffoons, though the San Francisco Ballet students are adorable, as is the dancing bear, ‘danced’ by the irrepressible Benjamin Stewart who gives the bear a quality of being real. Louis Schilling, as Madame, is always a treat to watch, as he imbues the large skirted matron with campy fun. I still miss the Mother Ginger of the old production who housed the multitudes of children under her enormous house of a skirt. There may have been a smoking chimney. The children do pile under the skirt in this production, briefly, but it’s not the same effect as being hidden under it to begin with. After all of that entertainment, one longs for something with a little more substance. And we get it in the Waltz of the Flowers, with the sweetness of Sugar Plum Fairy, and then the grandeur of the Grand Pas de Deux. Enter Mathilde Froustey. And please don’t exit ever again. The beauty of this dancer’s phrasing and floating port de bras cannot be overstated. Ms. Froustey’s Sugar Plum Fairy is all airiness, sweetness, and sunny warmth, with a smile to melt the polar ice caps. Amidst the Corps de Ballet’s lilting Waltz of the Flowers, with its shifting patterns, ensembles, entrances, and exits, the Sugar Plum Fairy weaves her way with delicate pointe work, grand jetés, and lightning speed chainées and piqué turns, adorned by the silkiest of arms. San Francisco’s heartiest balletomanes can be heard vocalizing their fervent desire to keep this ballerina here in SF. Whether she chooses to stay or go back to Paris, see her in every ballet you can. Some of her many strengths are musicality, petite allegro and speedy turns, but it is her artistry that is one of the company’s finest jewels. The ballerinas that dance Sugar Plum Fairy frequently alternate between it, Queen of the Snow, and the Grand Pas de Deux This means that at any given performance, one will generally get to see three beautiful ballerinas in the three main dancing roles. Yuan Yuan Tan. To many, “YY” is San Francisco Ballet’s most distinguished ballerina. Without a doubt, amongst the company’s elite Principals, a roster which boasts Frances Chung, Lorena Feijoo, Maria Kochetkova, Sofiane Sylve, Sarah Van Patten, and the afore mentioned Ms. Froustey and Ms. Zahorian, there isn’t one who outshines the legendary long limbed lines and lyricism of Yuan Yuan Tan. And it was she who got the honor of dancing opening night’s most coveted role. The Nutcracker Grand Pas de Deux, known in the biz as the ‘Nut Pas’, is the pinnacle of the ballet, regardless of whose production, choreography, or who dances it. Sometimes it is Clara and her Nutcracker Prince. Sometimes it’s the Sugar Plum Fairy and a Cavalier. In Helgi Tomasson’s production, Clara steps into a magical transformation chamber, and when she steps out, she is no longer a little girl. She is a woman, a beautiful ballerina, the elegant and majestic Yuan Yuan Tan, who dances with the Nutcracker Prince. And, darned good thing, as Tomasson’s Nut Pas is one of the most technically challenging of any version. Did I say Nutcracker? Am I forgetting about the ballet’s namesake? No I am not. Although our Nutcracker is unmasked in Act 1, his job, up to this point, has been mostly to fight the Mouse King, played by Sean Orza with much hilarity, miming about it to the SPF, and watching everyone else dance. It is only now that our new favorite Aussie (since Damian Smith just retired), Luke Ingham gets to show his noble bearing, skilled partnering, and the strengthening technique that recently earned him a promotion to the highest ranks, that of Principal Dancer. Tan and Ingham are beautifully matched and their ‘Nut Pas’ was one strong on power, lines, risk, thrills, and the infinity of Tan’s glorious legs, arms, fingers, neck, and very soul. A supremely dramatic artist, she is equally capable of achieving divinity through pristine classicism. Ingham is fast becoming one of the most sought after partners and the level of trust he has already inspired in Tan was evident on opening night. The pair elicited applause after every solo sequence, spontaneous cheers throughout, and the appreciation of a rapt crowd. Adrian Zeisel was delightful as the adorably naughty Fritz, Jim Sohm and Kristi DeCaminada gave an inspired reprisal of the revered and amusing Grandparents, standouts among party guests included Thomas Bieszka and Aaron Renteria, Max Cauthorn danced an extremely delightful and loose limbed Jester Doll, and of the entire corps de ballet, which usually has 2-4 costume changes each performance, not enough can be said. For the San Francisco Ballet Corps de Ballet women of opening night, and every night, those who dance on pointe as Snowflakes, Flowers, and more, many who will dance two shows a day for 31 performances, including apprentices, trainees, and students, their Nutcracker contributions may be the greatest of all. They drive the ballet with their dedication, their blood, sweat, and tears. But you will never see that. All you will see are radiant smiles, beauty, gorgeous dancing, sugar, spice, and everything nice. Every single one of them is necessary to create this most magical Nutcracker. Kimberly Braylock, Isabella DeVivo, Megan Amanda Ehrlich, Lacey Escabar, Jordan Hammond, Jillian Harvey, Ellen Rose Hummel, Koto Ishihara (just promoted to Soloist), Emily Kadow, Kristina Lind, Lee Alex Meyer-Lorey, Lauren Parrott, Elizabeth Lizzy Powell, Julia Rowe, Emma Rubinowitz, Grace Shibley, Miranda Silveira, Maggie Weirich, and Ami Yuki. Without them, there’d be no show. Go see it. It’s a San Francisco treat. This entry was posted in Ballet, Dance, Nutcracker, Odette's Ordeal, San Francisco Ballet and tagged Aaron Renteria, Adrian Zeisel, Alexandra Meyer-Lorey, Ami Yuki, Anatole Vilzak, Anthony Spaulding, Audrey Armacost, Ballet, Benjamin Stewart, Clara Blanco, Dana Genshaft, Dance, Daniel Deivison-Oliveira, Dores Andre, Elizabeth Powell, Ellen Rose Hummel, Emily Kadow, Emma Rubinowitz, Esteban Hernandez, Francisco Mungamba, Gaetano Amico, Grace Shibley, Hansuke Yamamoto, Helgi Tomasson, Isabella DeVivo, Jennifer Stahl, Jillian Harvey, Jim Sohn, Jordan Hammond, Julia Rowe, Katita Waldo, Kimberly Braylock, Koto Ishihara, Kristina Lind, Lacey Escabar, Lauren Parrott, Lee Alex Meyer-Lorey, Lizzy Powell, Louis Schilling, Luke Ingham, Maggie Weirich, Martin Pakledinaz, Martin West, Mathilde Froustey, Max Cauthorn, Megan Amanda Ehrlich, Miranda Silveira, Ricardo Bustamante, Ruben Martin, Ruben Martin Cintas, San Francisco Ballet, San Francisco Ballet Nutcracker, San Francisco Ballet Nutcracker 2014, San Francisco Ballet School, San Francisco Ballet Students, Sean Bennett, Sean Orza, SFB, SFBallet, Steven Morse, Taras Domitro, Thomas Bieszka, Vanessa Zahorian, Wan Ting Zhao, WanTing Zhao, Wei Wang, Yuan Yuan Tan. Bookmark the permalink.